Exponential Training > Personal Effectiveness > Top Tips for a Good Work-Life Balance? In the hustle and bustle of everyday life you can feel like you are competing in a never ending race at full throttle. In your personal life you may have children, a significant other, family and friends all of whom need time, care and attention. Then, of course, there is your professional life – the one that probably consumes the largest portion of your day, and most of your physical and emotional energy. If this sounds remotely like you, NOW IS THE TIME TO ACT! Get a piece of paper and draw a circle with 7 – 10 spokes; add a scale of 1 to 10 on each spoke; label each spoke with headings such as work, finances, friends, family, hobbies, personal development and so on. Now score yourself on each heading out of 10 using a green pen (with 10 being totally satisfied and 1 being totally dissatisfied). Now repeat the exercise using a black pen on where you would like to the scores to be RIGHT NOW. Shade in any negative differences (i.e. between the green and the black lines) using a bright red pen. The RED ZONE represents your Work Life Balance Deficit – where you are literally in the red, you are in deficit. Living in the red or in deficit creates stress, tension, resentment and harms others areas of our lives. The next step is to make a plan. Why bother with a plan? Plans help to empower us; they put us in control. When we feel stressed it is usually because we feel out of control – the next time you drive too fast around a tight corner the feeling of panic, worry, and fright that you experience is the direct result of feeling out of control of the car and the danger posed by the potential consequences. Closing your eyes at this stage will not straighten up the car, so why close your eyes when you feel out of control in other areas of your life? Remember the first three habits in Stephen Covey’s work, Seven Habits of Highly Successful People, (1) Be proactive; (2) Begin with the End in Mind; (3) Put First Things First. Being proactive, taking some form of action instantly makes you feel better, so start RIGHT NOW! Beginning with the end in mind is all about knowing what you want to achieve what you want. Covey also talks about creating things twice; once in the mind and then in reality. If you have not given the time and thought about where you want to be, the mind cannot work on developing ideas and plans to help you get there. Just as in a business, in life an end destination and a plan helps to keep us heading in the right direction. So what is your ideal destination – your outcomes – your ideal vision? Top Tip 3: Decide and Do It Now! Most of us do not make decisions as we leave other options available just in case – we like to ‘hedge our bets’. Let us look at a metaphor that might help us to avoid ‘hedging our bets’. To make a decision is to ‘cut off other options’ which means committing to the selected choice. Often we do not make 100 per cent decisions and keep one or two other options open just in case. There are occasions when this is important, but when thinking about our work-life balance surely some decisions need to be fixed. For instance, what is likely to happen if I say to my children or partner, “I will try to commit to spend more time with you.” You either mean it or you don’t. So what are your FIXED decisions to which you are 100 per cent committed? Once these are FIXED, they become life guiding principles or values around which other decisions are made. Before finalising them check out Top Tip 4. To achieve the work life balance you want means you need to understand the needs and goals of others: you need to work as part of a team. It is pointless committing to a goal that is incongruent with the goals of other people with whom you interact. Whether it is your partner, your children, your friends or your employer, talk to them otherwise your decision might be at odds with their goals and decisions. This seems to be one of the hardest things for most people to do. It’s also the last thing on most people’s list. No matter what you do, you must take some time for yourself to take stock and to review where you are. There is a saying that ‘plans are nothing, planning is everything’. Sometimes, we need to modify plans when they are not taking us towards our goals or if the goals are no longer the right goals. Taking time to reflect is important. So look at your plans, re-evaluate your decisions and take a global look at your work-life balance as things change over time. So do you have the work-life balance you want right now? The key word in the phrase is LIFE. 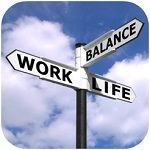 If you were asked right now on a scale of 1 to 10 how happy are you with your work-life balance what would it be? The key is to be honest with yourself, so tell it like it is, no worse and no better. What 100 per cent decisions are you prepared to make to improve your work-life balance?